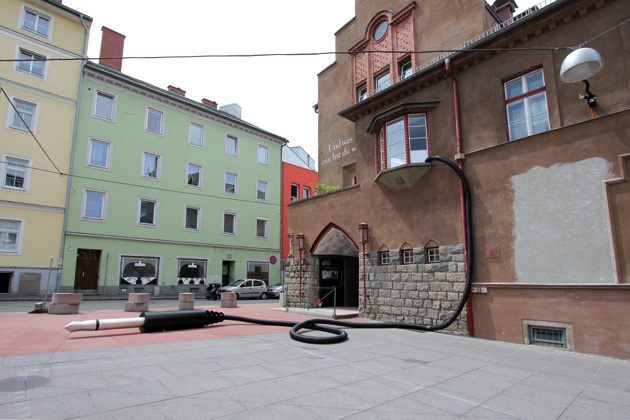 An oversized jack plug occupied the forecourt of the Upper Austrian Architecture Forum in Linz. The cable connected the outside of the building with the inside. The humming and vibrations coming from the plug were, in fact, transformations of the frequencies of the square, its buildings and the overhead wiring. These acted like a network of antennas supplying the haptic and auditory output to the contact pads of the jack plug. As a catalyst, it generated the acoustic subtext or soundtrack of the ensemble and made it perceptible. 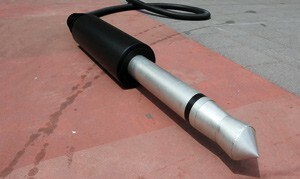 The jack represented an open interface by connecting the sound and the architecture of the square.